BRUSSELS, Belgium, December 19, 2011 (ENS) – Laundry and dishwasher detergents will have to be almost phosphorus-free in the future, following a vote in the European Parliament on Wednesday. The measures aim to protect aquatic life in waterways and seas around Europe. Parliament gave its approval to measures, which had been provisionally agreed with the Council of Ministers, with 631 votes in favor, 18 against and four abstentions. The Council now must formally approve the agreement for it to become law in all 27 European Union countries. Some EU countries already have phosphorus restrictions in place, particularly for laundry detergents. The new legislation will mean companies will be able to work under one set of rules, instead of differing ones across the 27 Member States. “By strictly limiting phosphorus in consumer laundry and dishwasher detergents we have done the environment a good turn and consumers will be assured that these products will be more environmentally friendly,” said Parliament’s rapporteur Bill Newton Dunn, a UK MEP who belongs to the Alliance of Liberals and Democrats for Europe. Phosphorus helps wash clothes and dishes, especially in hard water, but its release into waterways can lead to algal blooms that stifle fish and other aquatic life. Badly affected are the Danube Basin and the Baltic Sea, where harmful algal blooms occur annually. 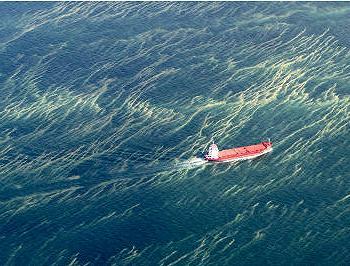 Wide, dense blooms damage marine ecosystems and harm the recreational and economic use of marine resources. Algal blooms can be toxic and so are not only unsightly but also a health risk for humans and animals. Phosphorus is a plant nutrient often used as a fertilizer. When phosphates are introduced into water systems, higher concentrations cause increased growth of algae and plants. But each alga is short-lived, and the resulting high concentration of dead organic matter decays. The decay process consumes dissolved oxygen in the water, leaving fish, other aquatic animals and plants without enough oxygen to survive. The main sources of phosphate discharge into surface waters are agriculture and sewage with detergents in third position. Treatment to remove phosphorus from water is expensive and not always available. 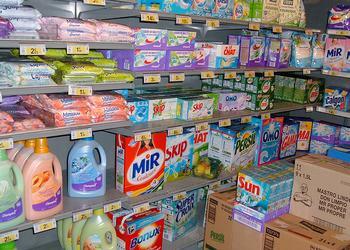 From June 30, 2013 a standard dose of laundry detergent must not contain more than 0.5 grams of phosphorus. Cost-efficient alternatives to phosphates are available for laundry detergents. At Parliament’s insistence, a deadline was also set for phosphorous in dishwasher detergents – a limit of 0.3 grams by January 1, 2017. For dishwasher detergents more research and innovation is still needed to develop adequate alternatives to phosphates without reducing the efficacy of detergents. The regulation does not affect detergents used by professionals because technically and economically feasible alternatives are not yet available throughout the European Union. The deal struck by Parliament brings dishwasher detergents under the rules, while allowing industry the necessary time to update its products. The Commission had proposed only a review to consider the possibility of bringing dishwasher detergents under regulation. The European Commission welcomed Parliament’s adoption of the phosphate rules. Member States can advance the date of applicability when certain conditions are fulfilled. The Commission has been asked to review the situation before December 31, 2014. The Commission will review industry’s progress in the development of technically and economically viable alternatives to phosphates in automatic dishwasher detergents to determine whether the deadline of January 1, 2017 can be met. The regulation is expected to benefit not only waste water treatment plants, with reduced costs for phosphate removal, but also consumers who pay for waste water treatment, and ultimately the environment.